You are currently browsing the tag archive for the ‘Alice Spider’ tag. 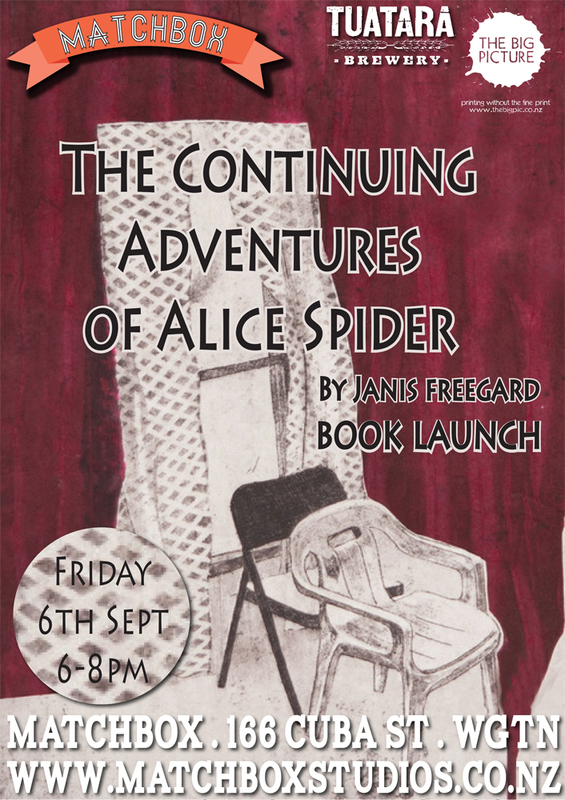 Janis Freegard and Matchbox Studios invite you to the launch of “The Continuing Adventures of Alice Spider”, a chapbook of prose poems published by Anomalous Press. 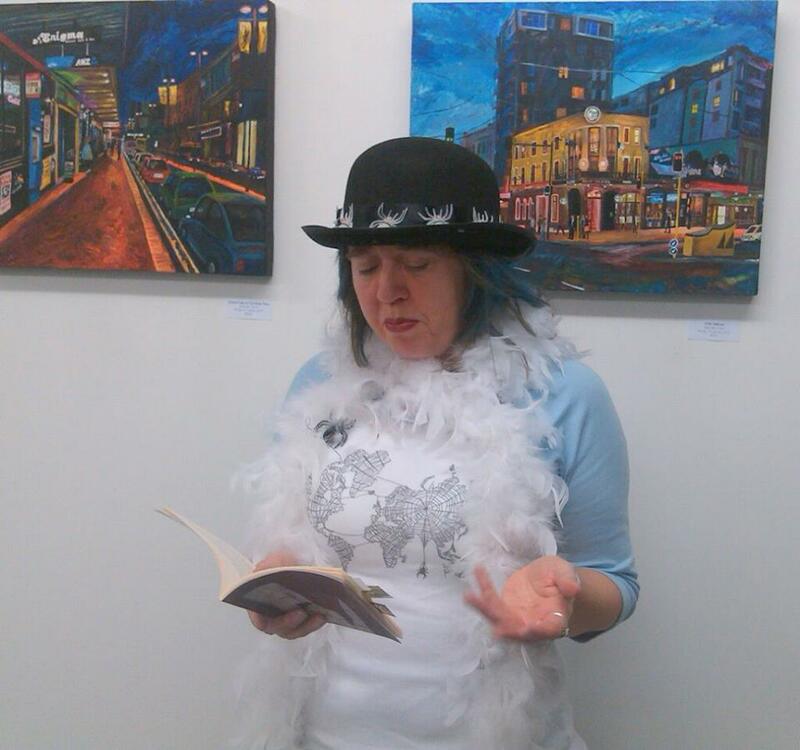 Alice Spider is a spinner of words, dancing them around until some spill on to the page. She’s both your one true friend and a trollopy little tart. Alice the Webster is weaving herself a wild, wild life. This prose poem sequence includes drinking champagne in a hot air balloon, an exploration of surrealism and an unusual encounter with a burglar. Welcome to Alice’s labyrinthine web. “Age cannot wither her, nor custom stale her infinite variety” – these words weren’t first written for Alice Spider, but they should have been. She is a heroine for our times – a multitasker of the human spirit and a joy in all her manifestations. Cherish her, and take her to your hearths. The stunning artwork on the cover is by Kristen Necessary. There is one last hurdle. The lovely people at Anomalous Press are making six chapbooks altogether (small collections of poetry, of up to 40 pages) as a labour of love and have launched a Kickstarter campaign to get the funds together for printing. They need $US5,000. If you would like to support them – and receive books, postcards and other goodies in return (this is a pre-order type deal rather than a charity drive) – here’s where you can pledge the amount you would like to pledge and a description of what you will receive. Yes, I’ve already put my money where my mouth is, and huge thanks to everyone else who is supporting the campaign. The Kickstarter link shows all the chapbooks being published and they look great! A selection from The Continuing Adventures of Alice Spider is now available as a limited edition hand-made pamphlet, published by Anomalous Press and featuring line drawings by Jill Kambs. It’s available from Vamp and Tramp booksellers in the States ($US45). More adventures for Alice coming soon! 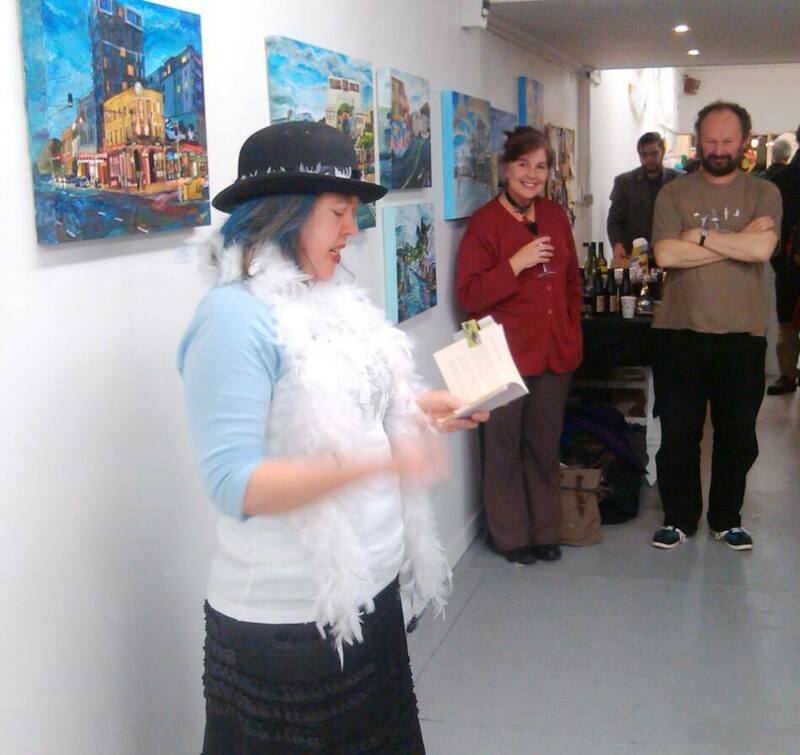 Alice Spider is a character who’s been haunting my poetry since I was about eighteen. She’s appeared in prose poem sequences in Turbine and AUP New Poets 3 (Auckland University Press) and danced her way through JAAM 28. 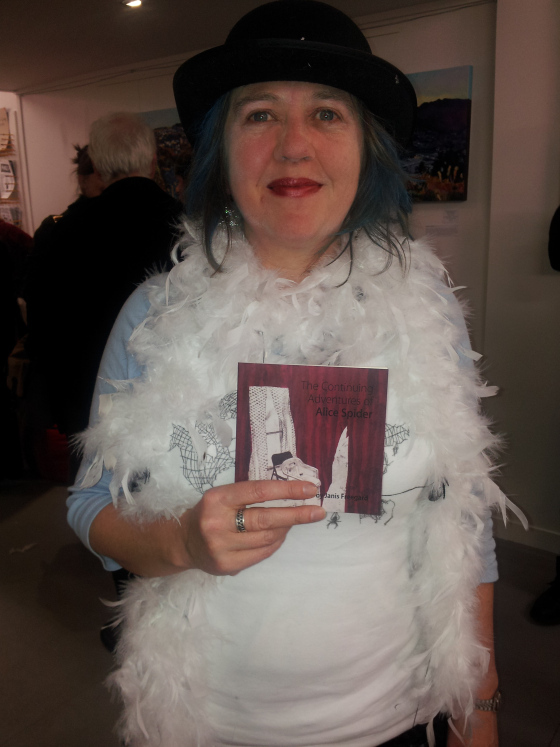 Now Alice has infiltrated the latest issue of Anomalous Press, alongside many entertaining international writers. Anomalous Press offers audio alongside its text. Downloadable versions are coming soon, but in the meantime, it’s all online. Finally the day comes when a poem matures, announces it’s leaving home and sets off into the world to seek its fortune. Once I’ve waved goodbye, it’s hard to control what happens to them, but I like to check in now and then to see how they’re doing. The other thing I found on the net recently was the first review I’ve seen of AUP New Poets 3. It’s from Trevor Reeves in Southern Ocean Review and if you’re interested, you can read it here: http://www.arts.org.nz/rev49.htm I must say I’m impressed with Southern Ocean Review’ broad coverage of poetry published in New Zealand with short reviews of pretty much every poetry book there is, as far as I can see. 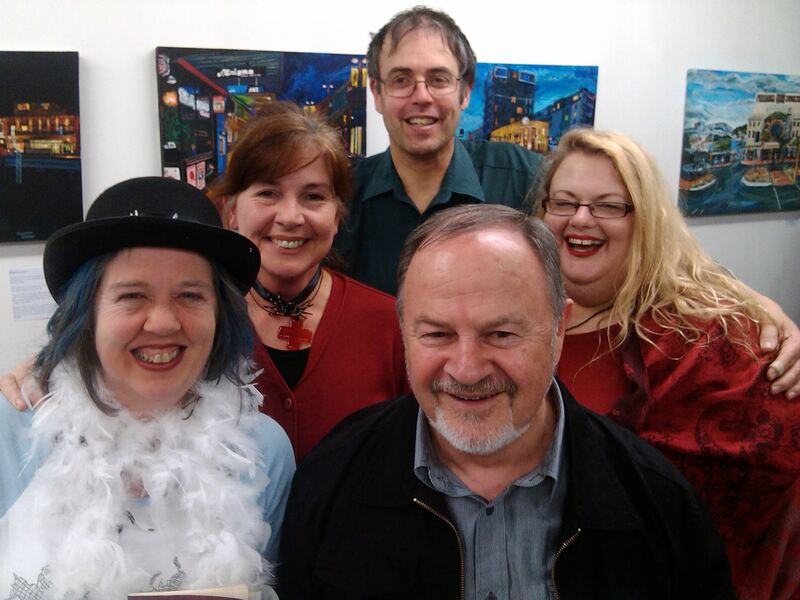 I was a little surprised to be described as a “fresh new voice from the Auckland region” given that I’ve spent the last 25 years in Wellington and most of my poems in the collection are set in Wellington – but I expect that was because Auckland University Press is the publisher. And I did live in Auckland for five years in my late teens, so I’m quite happy to be considered a JAFA. Trevor goes on to say my work “deals mainly with spiders” which is an interesting interpretation. To me, the Alice Spider character I write about has always been human, but I know some people see her as an actual spider. Anyway, there we have it. Poems which now have a life of their own. All I can do is hover in the background. Like a spider. OK, I have been out looking for spiders. 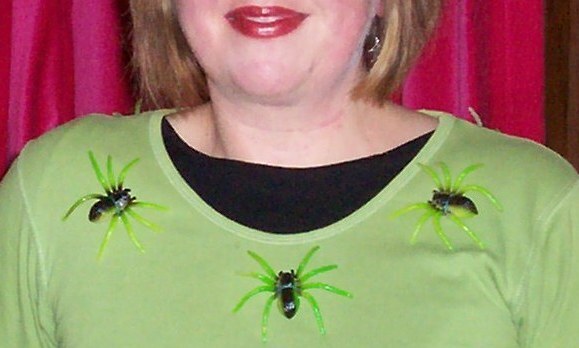 I have promised free spiders at the poetry book launch and I shall deliver. Over the past couple of weeks, I have been to every $2 shop and craft shop in Wellington and today I have come home with several bags of plastic spiders, in varying lurid colours. I thought it would be easier. I thought there would sheet upon sheet of spider stickers and fake spider tattoos, that the craft shops would be full of little wooden spiders and fluffy spiders and spider stamps. Alas, I was mistaken. Some of the things I found didn’t even have the right number of legs (8 – they’re arachnids; if they have 6 legs they are either insects or differently abled). And what is the deal with butterflies? Butterflies galore; butterflies as far as the eye can see;butterly upon butterly upon sparkly, glittery butterfly, but a sad and inexplicable lack of spiders. I like spiders. I had a flatmate once (who shall remain nameless) who, despite spending his university holidays working at the freezing works, would call me if he came across a spider in the bath. Personally, I was brought up to believe that spiders were worthy, fly-eating creatures and that, while it was permissable to vacuum up their uninhabited webs, the spiders themselves should be left to rebuild in the ceiling corners. If you want a spider of your own, do come along to the Wellington version of the AUP New Poets 3 launch. I’m hoping it will be at Mighty Mighty on Wednesday 13th August 2008, at 5:30pm, but right now I can’t get hold of Rich the Gig Booker to confirm. Katherine Liddy is also planning a launch in Vancouver – so it’s a truly global publication. Perhaps you’re wondering: why spiders? My section of the book is called “The Continuing Adventures of Alice Spider and other Tales” – a reference to an interminable prose poem I started writing when I was 18 or 19. Be kind to spiders: eight legs good; two legs bad.